One of my favorite ways to share my work and express my passion, is through Long Exposure photography. With this medium, it is possible to enhance color and fading light in a scene, where to the human eye; both color and light would normally appear to have all but disappeared. I especially like to use this effect for color photography; however this technique can produce fantastic looking effects to Black and White images. In either format, images can take on a surreal look, especially when the motion of moving water is transformed in to a sheet of silk, or clouds are turned in to streaks of light. The ingredients (or elements) needed to produce these effects, can vary according to each scene. However, below is a list of ingredients I used to capture the image featured in this blog. 1. Tripod Really? Dare I mention the obvious? An exposure of 300 seconds was used to take the image accompanying this post, so a steady hand just would not do it. 2. Cable Release Keeping your hands off your camera during a long exposure is critical, to avoid camera shake that would result in image blur. 3. Pro or Advanced Level Camera A camera with the ability to be set to record exposures upwards of 30 seconds. 4. Neutral Density Filter When attached to the front of your lens, or placed into a filter holder, this filter will allow increased exposure times. The strength of this filter is measured in stops. The highest stop value will allow the longest exposure times. There are several companies that make ND filters. The brand I use are circular glass screw on filters, and are made by B+W. I own two 10-Stop filters; to accommodate both 67mm and 77mm lens thread sizes. This filter is often used in combination with a Neutral Density Graduated Filter. A 10-stop ND filter is also great for long exposure photography, during the daytime. 5. Colorful Sky Even well after sunset, color can be recorded and enhanced with a long exposure. 6. Clouds If you want to create a streaking clouds effect. A sky with both cloudy and clear patches is ideal to obtain an effective surreal look. 7. Water Water in motion such as ocean waves, usually yields the greatest effect. The longer the exposure, the smoother the water. Thirty seconds may be enough; however an often used exposure to create the most surreal effect is around 240 seconds. 8. Wristwatch or Stopwatch To obtain an accurate desired exposure time. An alternative is to buy a cable release that can be electronically programmed to shoot chosen exposure times. These are called intervalometers, or timer remote releases. 9. Patience Like most things, obtaining the desired result can take patience. Having an understanding of how light works, and how light will effect the scene you are attempting to shoot is very important. Practice is often needed to perfect not only each ingredient of the shoot, but to also strike the right balance between them. Choose the right scene, exposure, aperture and timing, and you just may find that you will develop quite an appetite for this form of photography. The above image was taken 30 minutes after sunset. The exposure used was 300 seconds, at f/11. 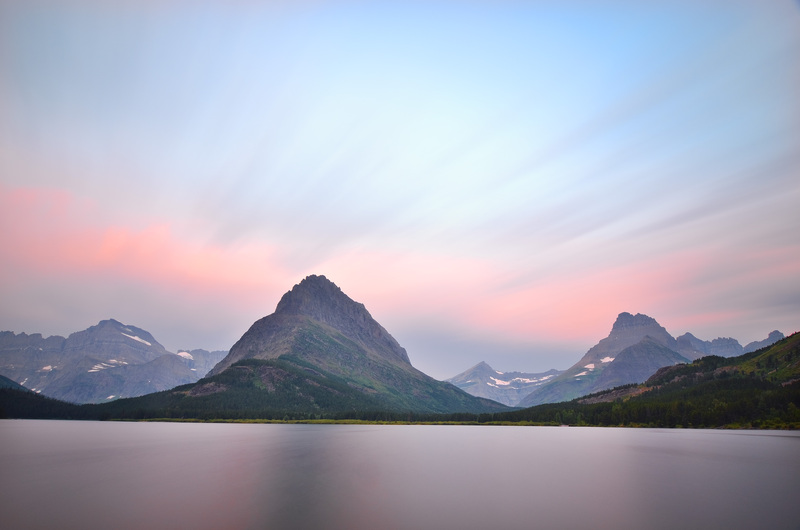 This entry was posted in Photography, Travel, Tutorials/How To and tagged david shield photography, glacier national park, landscape photography, long exposure, montana, mountains, photography, sunset, surreal, swiftcurrent lake, tutorial, twilight, water on September 4, 2013 by davidshieldphotography. 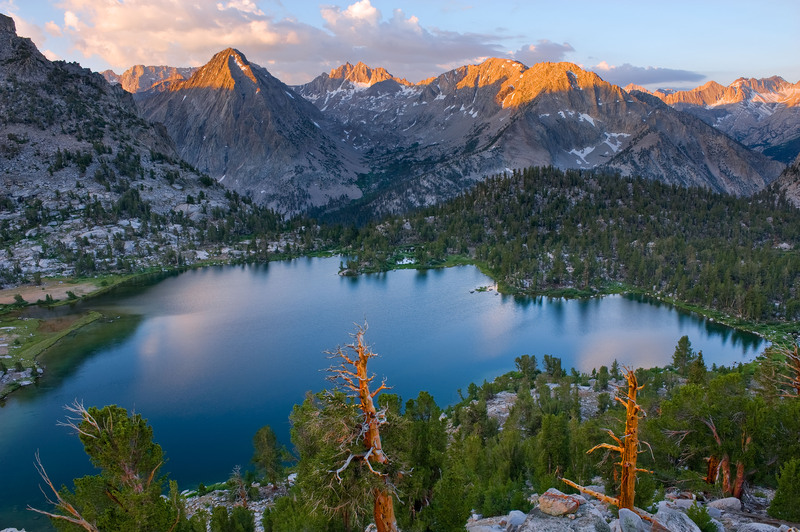 Reaching wilderness vistas such as Bullfrog Lake, may seem intimidating to many outdoor enthusiasts. However, with careful preplanning, accessing these beautiful higher elevation views might not be as hard as you think. Being prepared and knowing your limitations are just two of the most important elements to consider. Below, I will cover what I feel are the most important tips to assist you in reaching the heart of nature. First and foremost, it is very important to know what your body is capable of. If you are in reasonably good shape, you can probably prepare yourself quite easily for a longer hike. Keep in mind that many wilderness areas will require that you not only hike the distance lengthwise, but that you are also able to complete the elevation gain. Therefore, ensure that you have first attained all the details of the hike you are planning to take, so you know it is within your personal comfort level. Hiking into the wilderness usually means that you intend to camp overnight. With this in mind, if your destination is say, 5-miles, you will have enough rest and a chance to refuel before making the return hike. If you are new to hiking, start by walking in a local park, or an area that you want to photograph that has an easy to moderate trail. Maybe a mile or two round-trip. The important thing is to start out slowly, before steadily increasing the length of your walk or hike. Comfortably walking 5-miles in a day, is a good indication that you are ready for the next step. If you are preparing for an overnight backpacking trip, put some items in your backpack, and carry the pack during your practice walks. Doing this will also help you get used to hiking while carrying the extra weight of your gear. If the hike you are planning to take requires a substantial elevation gain, first make sure that you spend a good hour or two at a location where the altitude is higher than you are used to. Depending where you live, you may be able to do this by simply driving somewhere that is located at a higher elevation, such as a State Park. Once there, walk around as much as possible, and don’t forget to pack a lunch. Exercise, eating and resting are all important things to experience while acclimating your body to higher elevations. Many visitors traveling just to experience the great outdoors, make sure they have the extra time needed to get acclimated to the high elevation, before beginning a hike. I have met several people while on the trail, that have told me they are just hiking part of the trail, as a day hike, just so they can get used to the conditions. This is a great idea for hikers who are traveling from an area where the elevation is low, and have not experienced conditions at high elevations. Dress with the option of adding layers. Depending on the season, you may start out wearing just a tee shirt. However, temperatures in high elevation areas can drop dramatically towards the end of the day and into the evening. You will probably add at least one layer by the time you reach your destination. Your feet will probably feel the brunt of a long hike more than any other part of your body; therefore comfortable footwear is a necessity. If you buy hiking boots specifically for this hike, make sure you test them to make sure they are going to remain comfortable, throughout the journey. I usually test my new hiking boots thoroughly, by going on several long walks, in the days leading up to my trip. While you will want to make sure that you pack everything needed for your trip, it is very important that you pack as light as possible. This will go a long way in maximizing your overall comfort level, during the hike. Before buying any item for my trip, I always do extensive research to determine each item I eventually choose to buy. This determination is based on three important factors. They are quality, weight and cost. Take enough time to learn how to use your new gear, and to make sure everything works correctly. Whether it be your new mini-stove, headlamp or tent. I cannot emphasize this enough. Can you imagine trying to setup your new tent after a long hike, only to discover that you are not able to figure out how to do this. I always practice putting my tent up at home several times, to avoid what could lead to an uncomfortable and possibly dangerous situation, while out in the wilderness. A comfortable backpack is also essential for your trip. Another great thing about shopping at REI, is they have very knowledgeable staff. Not only will they recommend the best backpack for you, based on your needs, but you will be able to put the backpack on in the store, and walk around. They will even put items in the pack, as well as help you adjust the fittings to fit your body comfortably. Below is a list of gear I include in my backpack, while on an overnight stay in the wilderness. While I believe each item on this list to be essential, this is not an all-inclusive list, nor do I always use each item on every trip I take. Always let someone know where you are going, and when you plan to return home. By now, you have probably realized the importance of choosing the lightest gear possible. Don’t forget, you will be adding camera gear! I try to plan in advance for the exact type of shots I want to capture, and take just the necessary camera gear needed to achieve my goals. With enough preparation and careful planning, you will be far less intimidated at the thought of trekking into the great outdoors. The wilderness can be an incredible source of beauty and inspiration, and the rewards for getting into the heart of nature are often simply priceless. 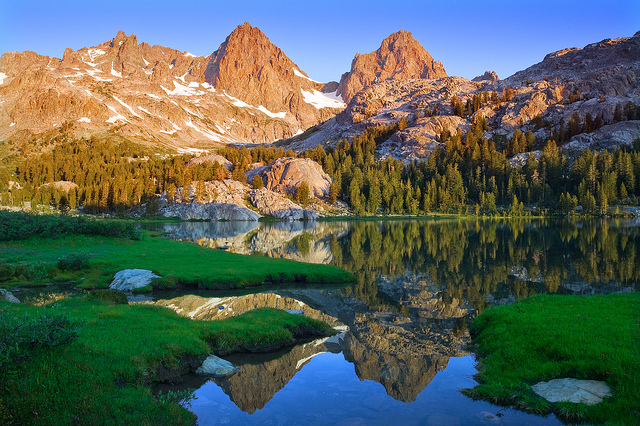 This entry was posted in Photography, Travel, Tutorials/How To and tagged adventure, backpacking, california, eastern sierra, guide, hiking, how to, landscape photography, outdoor photographer magazine, photography, tips, travel, wilderness on August 6, 2013 by davidshieldphotography. hile it is a natural feeling for a photographer to attempt to emulate the photographic capture of an iconic scene, the image below is an example of how rewarding it can be to also seek out lesser photographed views. Read below the image for more detail about how I photographed this scene, which is located above Twin Lakes, just outside the town of Mammoth Lakes, California. After scouting this location the day before, I decided to return here at sunrise to photograph this scene. A partly cloudy sky was forecast; however to my disappointment the sky was completely clear. Therefore, I chose not to shoot at first light, but to wait until the morning sun illuminated part of the scene, creating warm tones. Once the sunlight fully lit the trees at the left of the scene, I began shooting. I started out by composing for a vertical shot; however I also wanted to shoot this scene in horizontal orientation, so I quickly repositioned the tripod head, before the good light was gone. In this format, I was able to include more of the top of the waterfall; therefore I chose a similar shutter speed to retain detail in the water, as it tumbled over the rock ledge. 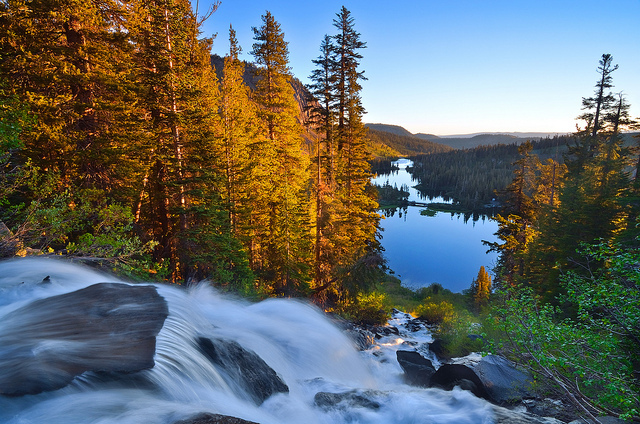 This entry was posted in Photography, Travel and tagged california, color, exploring, lakes, landscape photography, mammoth lakes, photography, scouting, sunrise, trees, waterfall on July 28, 2013 by davidshieldphotography. The result of location planning, and a little cooperation from Mother Nature. A while ago I found myself having to make an important decision. I had a choice; both options being great; however which one should I choose? My new website had now generated enough sales in order for me to upgrade to a new camera. With great anticipation, I logged onto the B&H Photo website, and began the process of buying a new Nikon D800 camera body. However, just as I was about to confirm my purchase, a thought ran across my mind. Instead of new gear; why not consider travel to a place I had never been to. After some thought, I feel that my decision really was a simple choice. While I would love to shoot with a new Nikon D800 camera, I realized that it was not a priority for me to own all the best gear; however it was a much bigger goal for me to visit as many beautiful locations as possible. It may sound cliche, but when it comes to camera gear and landscape photography; no matter how much gear you have, beautiful images can only be captured while visiting beautiful places. Traveling, especially far away places still requires plenty of research and preparation. Even then, bad or unexpected weather can lead to disappointment. One thing I learned from my recent trip was no matter how difficult, try not to have the highest of expectations. My biggest recommendation is if you are not traveling with an organized group, do as much research on your travel destination as possible. During my preplanning I selected the exact locations I wanted to visit, time of visit, length of stay and knew my options for overnight accommodation while at each location. Even though some bad weather resulted in my trip being far from perfect, I have absolutely no regrets. I feel that photographing new vistas has increased my knowledge of my trade, by making me more aware of light and composition than ever before. I also have a renewed desire to be a better photographer, and a passion to embark on new travel again in the near future. My decision to travel to Iceland resulted in an unforgettable adventure!